I was playing with some Embossable Acetate yesterday and this is what I ended up with. I stamped with Versamark and embossed with Pear Star embossing Powder. 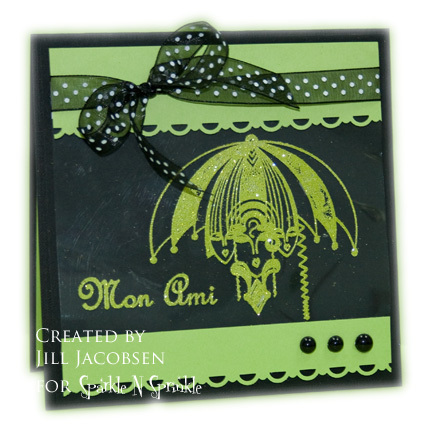 Then used Sour Apple cardstock and a border punch. I matted it on a black layer with dimensional tape, then on a black card base. I found just the green and black most striking!! The ribbon and dew drops just really finished it off! All the supplies are from Sparkle N Sprinkle. WOW & WOW!! This is just awesome! Wow is right! It's an amazing card, Jill. Such striking contrast in the colors! Love the colors! Simple, but eyecatching. Yep, the green & black looks awesome! That combo is one of my favorites....ok, who am I kidding, I like anything with black - so striking! Looks great Jill! Great card. Love the look of the green and black.